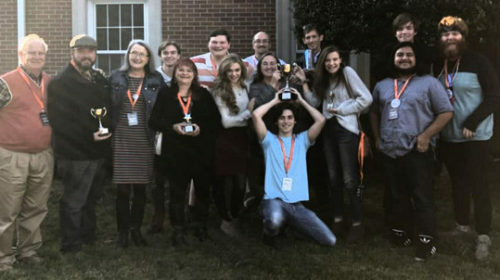 Two Upstate companies swept the competition at the South Carolina Theatre Association’s Community Theatre Festival this past weekend at the organization’s annual conference held this year at Anderson University. The Mill Town Players’ production of “Romeo and Juliet” and Guerrilla Shakespeare Company’s “Never Swim Alone” won Best Play honors and will advance to the Southeastern Theatre Conference in Knoxville, Tenn. in March 2019. Winning in Knoxville would qualify the productions for the American Association of Community Theatre’s national festival in June 2019 in Gettysburg, Pennsylvania. In addition, these two productions scored most every major award in the festival held at Electric City Playhouse. “Romeo and Juliet,” updated to an Appalachian Hatfield and McCoy setting, garnered honors for director Christopher Rose, Best Ensemble, Best Costumes (Beth King, Will Ragland and Sissy Beck), and Supporting Actor (Kelly Crittendon for her gender-bent role of Mercutio) and Supporting Actress accolades for Cindy Mixon for her role as the Nurse. “Never Swim Alone” also earned Best Actor and Actress awards for director Robert Fuson and Paige Vasel. Fuson, last year’s winner for directing the Proud Mary Theatre Company’s “I Am My Own Wife,” also won for his Lighting and Sound Design. The Guerrilla team also includes actor Eric P Spears, Stephanie Ibbotson, and Katie Mansure.